And seeing Clint work at replacing the bathroom light was the crack that broke open the dam. The new fixture is slightly smaller than the original, so a paint touch up was in order. This invovled finding the right can of paint. Finding a brush. Finding a stir stick. Painting one coat that looked way too light. Painting a second coat and realizing that it was perfect. Waiting for the paint to dry. This is something my dad woulda/coulda done in minutes last year. This year he can't do it at all. He was my handy man. I'd make a list of all the things I needed done, then invite him to come over with his van - his toolbox on wheels. He'd work his way through my list, share a story or two, look for grape pop in my fridge, eat some left over food and be on his way. And it hit me like a semi skidding sideways on the freeway, that he won't be doing that again. So the tears that have been stored up for the past week because I haven't had time to have a GOOD cry, decided to pour out of my eye sockets. With gusto. Enthusiasm. With pent-up pressure. Oh the wailing. The sob-ob-ob-ob-ing. The big intake of breath and then the high pitched whine. I would have loved to have sat in my room and just let er rip but I had so much to do. So I walked back and forth from my bedroom to the washer, to the dryer, folded clothes and put them in the kids' rooms, then gathered up damp towels, put another load in the washer, all the while moaning and crying and gasping and weezing and schnurfling while my kids each sat at a computer and ignored me. "Sorry to be carrying on like this," I said to my boys, still bawling like a baby needing a diaper change. "It's nothing you did. I just need to really cry, I haven't had time til now. I've been sucking these tears back for about 10 days and they need to come out tonight." "K," they said, not even looking up from their games. 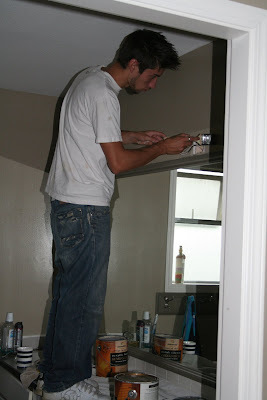 Tonight, now that the paint is dry, Clint tried to attach the new fixture to the wall. "Do we have a screwdriver ?" he asked. Are a screwdriver and a drill the same thing? Because I think I have a cordless drill. If you add a screw bit to it, won't that work? Didn't matter. We couldn't find any screws. Dad has a truck full of them. I couldn't find a single one in this house. Maybe I do need a husband. Or a fully loaded toolbox. Either or. 1. Sandra read my last blog entry and thought I needed a friend tonight. When I got home at 9:15 pm she was sitting on my ottoman (the kids were all out) trying to set my VCR so that I could tape my favorite shows. She said she was over to listen if I felt like talking. You just can't buy friends like this. 2. You should come over and see my inbox. Holy cow. This past week, even before I wrote about my dad, people (female people) have been sending me messages of encouragement and support. Even teenaged female people wrote some awfully nice affirming things. You just can't buy mail like this. 3. At 3 pm on Saturday, when the youth retreat ends, I'll have some free time. A block of free time. I'm kinda giddy just thinking about it. What shall I do? Thank you, friends, for loving me this month. Today? I'm feeling blessed and so very lucky to have you in my life. God sees those tears, believe me, I know. I cried buckets last winter, thought the unhappiness would never leave. But then, bit by bit, the Lord did amazing things for my mum. Things I didn't expect. Keep hanging onto the Lord, keep praying, keep on getting His robe wet with your tears. You couldn't (or your father couldn't) be in a better place.